A group of major m-commerce companies announced a large-scale U.S. trial last week to include contactless payment, mobile content and premium arena services at Philips Arena in Atlanta, Georgia. The companies claim the trial will be the first large-scale test of next-generation mobile-phone applications in North America. The grouping includes Chase, Cingular Wireless, Nokia, Philips, Visa USA and others. The contactless payment functionality will be based on Near Field Communication (NFC) technology first developed by Sony and Philips. Other NFC trials are underway in Germany and France. Wireless Watchers will know that the Sony/Philips NFC technology is also powering the super-successful “FeliCa”-branded mobile contactless payment services in Japan and has been adopted by NTT DoCoMo, KDDI and Vodafone as the de facto market standard for m-commerce, e-wallets, transportation and other peer-to-peer data transfer services. NFC was first deployed in the Octopus card in Hong Kong in 1997 and the first mobile handset trial ran in Japan in December 2003. Today, over 7 million FeliCa-enabled phones have already been sold by DoCoMo alone. One might think the two-year jump on deployment and commercial experience, not to mention brand equity, in Japan would motivate Sony to transplant an obvious success story from Tokyo to markets elsewhere. Instead, it looks like the wheel is being reinvented all over again. According to the Nokia trial announcement, approximately 150 contactless point-of-sale (POS) readers have been deployed by partner ViVOtech throughout Philips Arena, a major sporting venue. Cingular Wireless will provide mobile content downloads via its digital wireless network, and the phones will also be used to for contactless transactions aiming to enable faster and simpler payments at concession stands — getting fans out of the waiting lines and back to the game with beer and hot dog in hand. 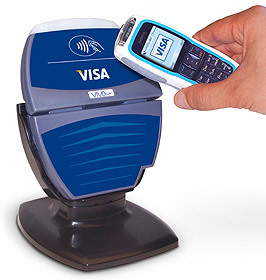 At checkout, the phone is simply held near a secure reader and the contactless payment transaction is automatically charged to the user via the Visa payment network — the same one normally used to process traditional credit-card transactions. Fans will also be able to access and download mobile content such as ring tones, wallpapers, screensavers and clips from favorite players and artists by holding their NFC-enabled phone in front of a poster embedded with an NFC tag. We applaud the fact that NFC players have at least realized that you really have to bang heads together to get the value chain lined up, something which in Japan has largely been done by DoCoMo and Sony, two of the biggest heavyweights in their respective areas. But we wonder why Sony (with their tech partner Philips) isn’t pushing the use of the “FeliCa” brand as well as investigating the potential for mobile payment interoperability between FeliCa-enabled merchants in Japan (there are tens of thousands and Japan Rail have just announced the start of “Mobile Suica” for transportation use). The brand equity alone is worth millions and we see no reason why the made-in-Japan cool factor couldn’t provide a nice boost to the launch (or even trialing) of NFC-based services elsewhere. Meanwhile, at current handset replacement rates in Japan, we can easily forecast that 50 percent of mobile customers in Japan will have NFC embedded IC chips in their phones by the end of the next fiscal year (March 2007). With Japanese device makers (NEC, Sharp, Panny, etc.) working hard to get their latest 3G models into markets in Europe and elsewhere, it won’t be long before we’ll see “FeliCa” handsets offered in places like, say, Atlanta. Perhaps then the brand value and experience gained in Japan with contactless payment commercialization will become more compelling to the industry.